Review nouns, verbs, and adjectives with this penguin game. Click on the pic to download.....and please don't forget the comment! Just discovered your blog and love your things! Thanks for this great one, we are studying penguins this week and this will tie in great! your resources are amazing! 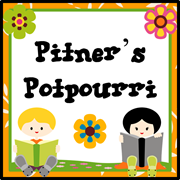 Thank you for sharing..... do you happen to keep a list of your literacy/story choice books for throughout the year? Thank You! I'm "just" a parent, looking to supplement in the areas my kids are weak in. It's not so easy to find fun things for the older kids, so thank you very much! Thanks for the terrific share, Mary! It's an "oldie but goodie!" Thanks, Joanne. 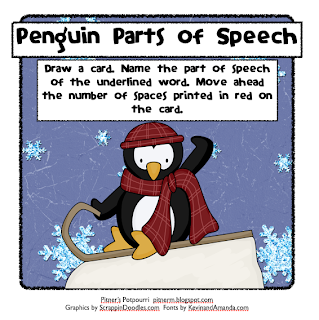 I have several penguin-themed activities posted on my blog. 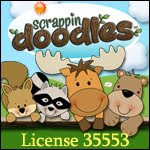 I've scheduled several to be posted on Classroom Freebies, also. Thanks for the freebie...looking forward to using it with my students! Thanks, Bee Speechie! Keep checking my blog. I have more penguin-themed activities posted already and will be adding more. This is so cute! I can't wait to use it with my students!